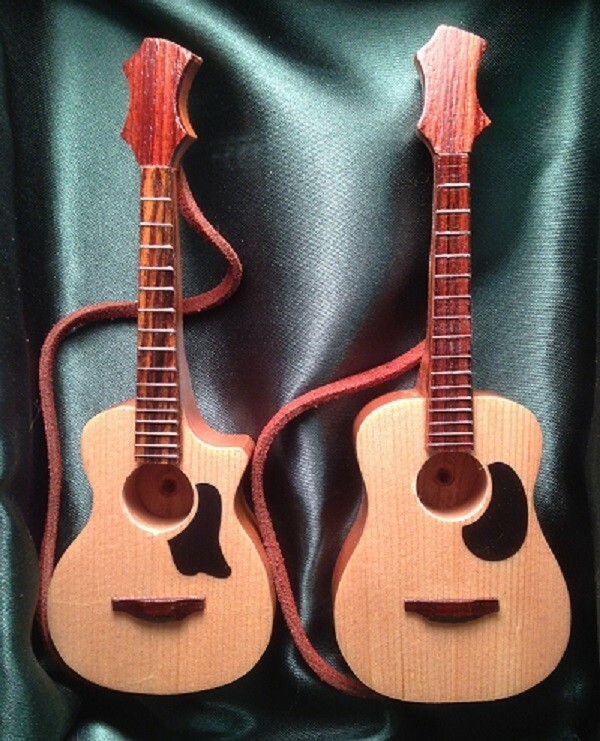 These guitars are 6" tall by 2-1/4" wide and made with a quartersawn bookmatched solid spruce top with a solid Black Cherry wood for the body. It has a rosewood fingerboard and actually has individually inlaid frets. The head stock is removable and has a leather strap that connects the headstock to the body.They are available in two different body shapes. Small body with a cutaway and a dreadnaught. They can be hung on a Christmas tree using the leather strap or can be set on the stand (included) to put on your fireplace mantel or display it on any table. This guitar pipe makes a very fine gift for your "Smokin Hot" guitar playing friends! They have been individually inspected to ensure the highest quality of craftsmanship. They all come with ser#'s and a certificate of authenticity, a brass screen and a small levour bag is also included as a carrying bag. Please call 440-474-2141 and order yours today!